^ I can't wait for 2023, when it's all (supposedly) finished with the renovations and the new Attractions / Lands. did to it in Disneyland back in 1998! Who knows? Possible? Hmmm. 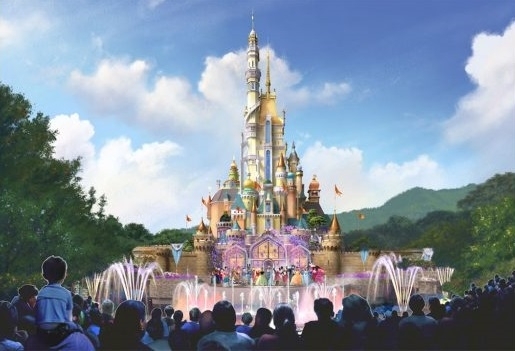 Hong Kong Disneyland is in the middle of its multi-year development from now until 2023. Which includes the beginning of the transformation (or refurbishment if you want to call it that) of Sleeping Beauty Castle in January 2018 and completed by sometime in 2019 (no date is set yet). "Hong Kong Disneyland will kick off the castle’s transformation following the finale of the “Disney in the Stars” Fireworks on January 1, 2018." There are no other details other than what’s stated above. Meaning, it’s not clear how visible the castle and hub area are starting January 2, 2018. Once we know more information, we’ll keep you updated. 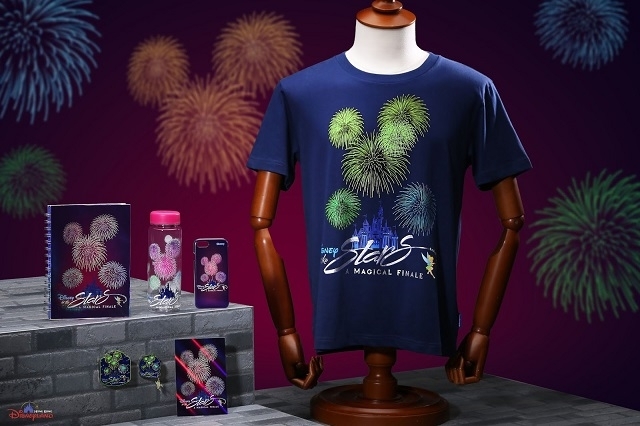 Between now and January 1, 2018, guests are able to collect a commemorative sticker celebrating the Disney in the Stars fireworks show. There’s also commemorative merchandise available at the park. Some of the stuff available till January 1, 2018. We have more 12 Days of Disney Parks Christmas news to share today! As part of Hong Kong Disneyland’s multi-year expansion plan, the icon of the park will soon be reimagined and undergo a transformation, the first-of-its-kind at any Disney park. Today, we have a new rendering to show you what a magical centerpiece the new castle will be for our guests in Hong Kong! The classic castle will draw inspiration from a variety of storybook influences and styles, with new thematic spires, domes and a design that reaches ever skyward. Features will be inspired by many of the Disney princesses, including special finial decorations on the spires such as Snow White’s apple, Cinderella’s coach and Belle’s rose. Original artwork and unique sculptures will add even more magic and fantasy. Guests will be able to visit the all-new Bibbidi Bobbidi Boutique for transformations of their own and meet Disney princesses at the castle. 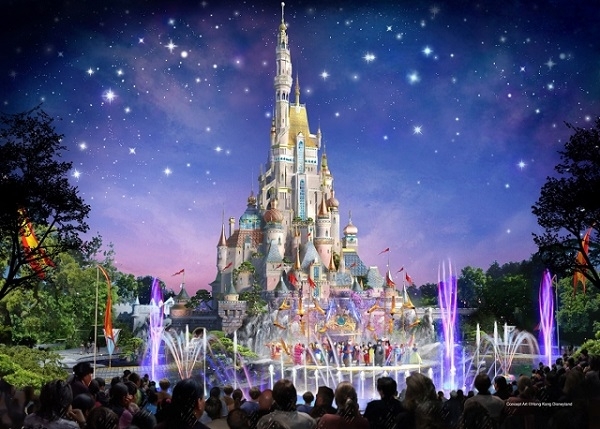 The changes will also take the park’s entertainment to new heights with the premiere of a new daytime show and nighttime spectacular against the impressive backdrop. like those great "cars" in Luigi's Rollickin' Roadsters at DCA.... hmmm. Hmmm. Possible? Wait and see, I guess. The artist conception. Free dancing sleighs, right? Awesome! The castle is supposed to be "transformed" by 2019. Fences all around it, front and back. Photo by DMK_Blog, thanks! Since its January 2017 opening, Iron Man Experience has become the most popular attraction at Hong Kong Disneyland, and an entire Marvel-themed area is underway at the resort. But that’s not all that’s planned for Marvel fans: Chapek shared details about a second Marvel attraction that is set for Hong Kong Disneyland, where you’ll be able to team up with Ant-Man and The Wasp to fight Arnim Zola and his army of Hydra swarm bots. track be in the open, and become an "interesting looking" photo op, when a train passes by? The map shows only a small part as a tunnel for it now, but I wonder if they'll make it longer? Galaxy's Edge trackless ride attraction is contained in. re-themed it for Marvel purposes, precisely for Hong Kong? This wouldn't be a bad thing. As much as I like Buzz Lightyear, I'm all for a new shooting dark ride for Disney--they have enough Toy Story stuff now. Last edited by cfc on Wed Feb 14, 2018 8:45 am. No problem with Tomorrowland being gone at all. I grew up with the park and I honestly would have no issue if any of the opening day attraction is gone. That Tomorrowland is sad and I’m so glad Disney is working to change it. Now please get rid of that stupid Hyperspace Mountain overlay. If they do a survey I’m fairly confident that most guests would want the Michael Giacchino soundtrack back.